Hopefully I’ll be able to come up with a catchy title for this feature. Our first profiled photographer is Matt Callow aka Matt Blackcustard aka the Guy Who Uses All the Weird Cameras aka He Whose Photos Were So Cool That I Had to Create This Feature to Ask Him Questions. Our second profiled photographer is Marjorie O’Brien, known on Flickr as I am Jacques Strappe and Quite Fond of Theaters. Our third photographer is Bobby Alcott, known on Flickr as UrbanTiki and the founder of EXPOSURE.Detroit. Are you interested in seeing, and do you ever display photo’s from other Michigan photographers? You bet we are interested (and do display) work from other Michigan photographers. If you are a Michigan photographer with work online, please feel welcome to post a link to it! Glad I found this site; I am new here to Michigan, love it here, and am very enthused about this great state and its people. Looks like others are too! Keep clicking and posting- I love browsing people’s visions…! I always thought it would be great if someone started a meetup for Michigan photographers ala the regional groups at photoblogs.org. I'm Kate Sumbler (http://www.flickr.com/photos/ktpupp/) and my husband is Rob Sumbler, (http://www.flickr.com/photos/sumbler/). Rob's strawberries and asparagus pics were recently featured on absolutemichigan.com. I belong to the Michigan Virtual Assistants group and we are designing a new website. We would welcome any artists to submit their photographs for consideration on our Home page that will include artist recognition and contact information. We do not have funds to pay for artwork at this time, however, we would love to feature a photo from Michigan. I’m located in Flint but you’ll find some beautiful nature and urbana shots in my gallery. I photo from MICHIGAN too! I’m Southern Michigan area, check out my photos! i need help locating a photo that was in a store in mackinaw city. the store is no longer there. the photo was taken by a michigan photgrapher. not sure how to find it but i have resorted to the big wide web and i am still having trouble. the photo was of 5 deer in the fog. you couldn’t see the deer when you glanced at the photo but if you looked closely, you could see them all in line-all in a different position and all looking at the camera. it is a great photo and i should have just bought it when i saw it but i missed the opportunity. now i can’t find it and it has been haunting me for about 3yrs. can anyone tell me how i could locate it? the store i visited didn’t seem to know. I am Michigan Photographer who is blessed by a day job that requires me to travel all over the state on nearly daily basis. Critics welcomed. And thanks for taking a look at my work. Good find, Shirl! The picture is Snow Angel Deer (at Carl Samms site). Neat photo too. I’ve loved Carl Samms work for ever so long. Thanks for providing the link! I am interested in purchasing a nice Michigan photograph…as a 15th anniversary present for my husband. He grew up in Huntington Woods, just north of Detroit, in the 70’s and 80’s and went to U of M.
I’m a Detroit area photographer covering events, fashion, music, film and more. My website has nearly 50,000 photos and it is continually growing. If anyone is looking for a great professional photo hosting site, just ask. I’m also a web developer. … and you’ll find my photos on a lot of other sites. I organize several photo / fashion projects. I am a professional photographer in Troy. I am blessed to take people to experience the wonder of the Serengeti 3 times a year. However, my tag line of ‘Finding beauty in your daily life is as easy as looking for it’, is especially true here in michigan. I have a Michigan gallery at http://www.acaciaphoto.com/michigan. Nice to see so many fine photos of our beautiful state. Feel free to view some art of the Spinning Lens at http://www.spinninglens.com. High school sports, with some rodeo, horse pulls, fireworks, and concert photos. One of Michigan’s busiest action photojournalists, Cincoman Digital Imaging, aka Fiveman, shares works via MLive’s preps message boards. New to the PRO photography game (shutterbug for a few decades though), but since moving to upper Michigan love it even more — Yes, even when I can’t break even for the year ! Thanks for allowing me to post here. Very nice site. Come visit us at our site. I love Michigan and I love creating images — the two go very well together. I have pictures from upper Michigan and 14 other states. I have posted, on my website, new photos of Port Austin, Michigan. Hello from a Michigan nature photographer! I post photos fo Michigan everyday, mostly barns, flowers, wildlife, birds, nature and everyday life in Michigan. Hello everyone! I’m also a Michigan Photographer, and I have just started my career as a pro. Feel free to take a look at my work. I just came across your site while doing a search for Mackinac Bridge fireworks pictures. I’m a MI photographer and thought you might enjoy the pix I captured during the 50th Anniversary celebration. What a talented group of photographers! It’s nice to see so many great photos of Michigan in one place. I check this site frequently to find fresh talent and great photos for Michigan History magazine. Keep taking pictues everyone! Your sharp eye for the perfect shot keeps people interested in Michigan and all the beauty our state has to offer. Hi everyone, wonderful to see so many other Michigan photographers. I was really pleased to see the piece on the front about the Shiawassee River. I’m in Owosso and the river is about 100 yards from my front door. Hello! How wonderful is this! I am a photographer out Cedar Springs, just north of Grand Rapids. I specialize in relationship photography. Everything from engagement pictures, weddings, maternity, baby, family, seniors, and all the other special events in your life. I will check back and visit some of you. Right now I have to get this article finished! Hi all — just stumbled on this site while looking for shots of Miner’s Castle AFTER… I shoot all over, do fine art shows in the summertime. My site is http://www.parkerparker.info — blog also. Feel free to drop me a line! Been a lurker in this site for a month or so now. Just popped into this link for the first time. I’m down in Kalamazoo and haven’t ventured to far away since getting heavy in to photography. My new Detroit color photography book published by Wayne State University Press is now available. 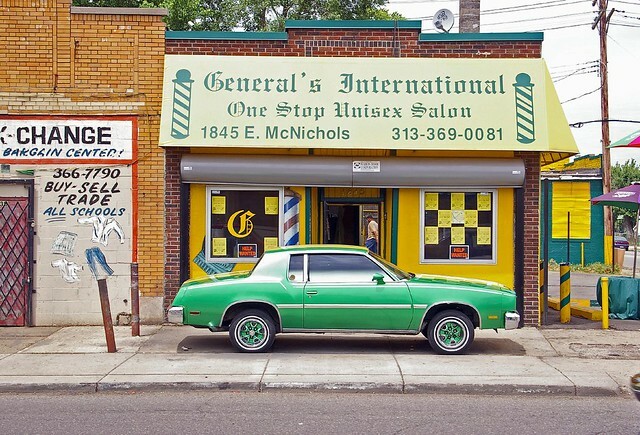 Talking Shops: Detroit Commercial Folk Art is a look at the efforts to maintain the American Dream of owning your own business and selling a message painted on buildings, signs, and walls. Examples of Talking Shops can be seen at: davidclementsproductions.com. Hi everyone. I would like to add to this list too! I am another amateur photographer from Michigan. Western Wayne Co.
Hi. I’m a photographer from the north eastern side of the state. I’ve just started my website but feel free to look around. Photos added daily. My name is Troy Johnson and I’m a photographer covering the Metro Detroit area. I’m very diverse so there are many different styles on my website. There’s portraits, art work, sports, and nature shots. Feel free to check them out as well as other sevices that I provide. My website is still farely new, but check it out! http://travel.webshots.com/tag/michigan will direct you to a very broad selection of michigan photo albums. My two Michigan albums are there – one of the Mackinac Island & Bridge area, the other of Northern Michigan, both UP and Thumb areas. The “Northern Michigan, Seasons, Sunrises, Beaches, Waterfalls, Mountains” album is well over a half million views and 75,000 downloads. (Free.) The Mackinac Island album is over 250,000 views. They are (at present) the #1 and #2 Michigan albums for Webshots photohosting. Some of the pictures are specifically composed and cropped for desktop use, including some for WXGA aspect ratio. I enjoy taking and viewing nature photos and I think Michigan has some of the best nature around. My sights are http://myphotographymypassion.blogspot.com with my nature photos and http://lifewiththewoods.blogspot.com this is about my family’s daily life and our adventures many of them involving activities out of doors. I rarely leave the state of Michigan these days so, most of my photos are from the great out of doors in Michigan – mainly St. Clair County. My own yard (12 acres) is always changing with each season. If I sit still long enough I’ll see the deer making their daily migration from the east to the west then back again. I recently came across a photographer in Muskegon, Michigan. His name is Justin Calkins and has photographed the Rothbury Festival. Great Pictures! Capturing the experiences of life. Just a recreational photographer, but I love showing off our beautiful state! I have been photographing the Northern Lights and many other subjects in the Upper peninsula of Michigan for many years. I love in Menominee MI. You can view my photography at my website below. Awesome blog I’ve been looking for more ways to connect to fellow photographers in Michigan. I just got my new site up at http://www.quincycrawford.com check it out let me know what you think. I specialize in Portraits but just book my first wedding and engagement session. We’d all agree that nowhere photographs quite like Michigan. We’re definitely fans of Michigan in Pictures over at WMTA and West Michigan Weekly (http://westmichiganweekly.blogspot.com). Thank you for always sharing such great images! Just another avenue for all those Michiganders out there: we just started a weekly photo meme for the west side of the mitten. Please come visit and participate! I’m a self taught professional photographer from the Upper Peninsula and this is my work…feel free to check it out. Hope you enjoy! I’m a photographer in Ypsilanti. My blog is about 90% Michigan stuff and some of my other travels. I can’t believe it, but it’s been 4 years since I left a comment here. I have many, many more photos in my portfolio now, and I even have my own website! :-) Feel free to have a look! I am a southwest Michigan landscape photographer based in New Buffalo, MI. In the event any of your readers are interested, our local galleries are holding the annual Art Attack weekend this April 29 thru May 1st. I have been invited to display some of my work, along side of several other excellent photographers, by The Local Color Art Gallery in Union Pier. Join us for a Photographers Reception. See the harborcountry.org website for times and addresses. Hello! I’m a nature photographer and writer based in both the U.P. and the L.P. My note cards are for sale at http://www.Etsy.com/shop/KLJnaturephotos, http://www.MIUpperHand.com and at the Gift Station in Munising. I also have a Web site (see above). Prints are available of all my images, and I’m always looking for markets for my editorial photos. I hope you’ll take the time to visit these sites and give any feedback you wish. I encourage reviews and suggestions! My best to all Michigan photographers — what wonderful work I’m finding here!!! Hello everyone, I’m a nature & landscape photographer living in Portland, Michigan. I’ve been a serious shooter for over ten years and I am now enjoying it more than ever. I have a photographer friend who lives in the U.P. who doesn’t seem the type to do her own bragging so I’m going to. :) She does incredible work. Being I live in Texas and have never been further north than Oklahoma, I had no idea your state had such stunning beauty before I saw her photos. Stop by if you get a chance. Hope you enjoy her work as much as I am. I love looking at your pictures here. It brings back a lot of childhood memories! So I have nominated you for the “7×7 Link Award”. hello im a amature photographer with my own equipment. im retied from lawenforcement but i have talent with the camare, if you need any pictuers in metro detro area please call me 313-948-1598. i can assist. you . my email richarddavid0512@yahoo.com. i just need part time work. tks i hope yo here from you. I worked as a photographer in Detroit in the 1940s. I am just starting out to be photographer and I have some pictures . I dont know where to send them too . So I am ask for anyone help. You can share them in the Absolute Michigan group on Flickr and on the Michigan in Pictures Facebook page if you want them considered here.